Control 4 is our complete automation system solution. Control 4 offers AV control, Multi-room Audio/Video, surveillance, intercom and lighting. Control 4 offers fixed wall controllers, handheld controllers and application based controllers for IOS and Android. If you need a control solution for a single system, home cinema or to automate your entire home! Control 4 has a perfect solution available! You put the soul in your home. Now let RTI bring it to life with control systems so powerful, yet so intuitive in operation, that you become one with your surroundings. From home theatre to state-of-the-art home automation, RTI control systems fill your world with music, movement and light. Technology that used to complicate, now delights, and life is once again in harmony. This is the RTI-enabled home: an oasis where your needs are fulfilled through technology. Where devices adapt to your needs, rather than the other way around. And a world of pleasures can be summoned – instantly, effortlessly, with a simple touch. ClareHome is a professionally installed, full-featured home automation solution. The system scales in size and cost to deliver the same luxury-level performance in homes of all types, from a 1,000-square-foot condo to a 20,000-square-foot luxury home...and beyond. ClareHome is not a Do-It-Yourself kit that requires technical skills. And, better still, it's not a security company add-on that ties you to an expensive monitoring contract. You personalize the system to your family’s preferences with our popular applications. Install what you want today with the confidence that your system can be upsized and updated as your needs evolve and as we introduce exciting new applications. Video Surveillance – Security cameras at your front door and in other strategic locations help you keep a watchful eye on your home and your family, from wherever you are. Door Locks – Smart door locks let you keep constant tabs on who has access to your home, and when. Lock and unlock doors remotely, and receive notifications upon entry. Security – Integration with the Clare system keeps you aware - and in control of - the arm/disarm status of your home security system, even when you're away. Garage Door Control – You'll always know if your garage door is open or closed, whether you're in bed, around the corner, or away on vacation. Lighting – With smart lighting including controllable switches, dimmers, Scene keypads, and receptacles, you‘re always just one touch away from the perfect lighting ambiance (and energy savings). Home Audio – Couple our multi-room amplifier with in-ceiling speakers to fill your home with music from your own library or streaming internet radio (e.g., Pandora, SiriusXM). Climate – Wireless, smart thermostats under system control help assure year-round daytime and night-time comfort, and also make for an energy efficient home. Video Entertainment – Home video and home theatre systems are easily integrated into your Clare system, adding simplicity, convenience, and a whole new level of cool. 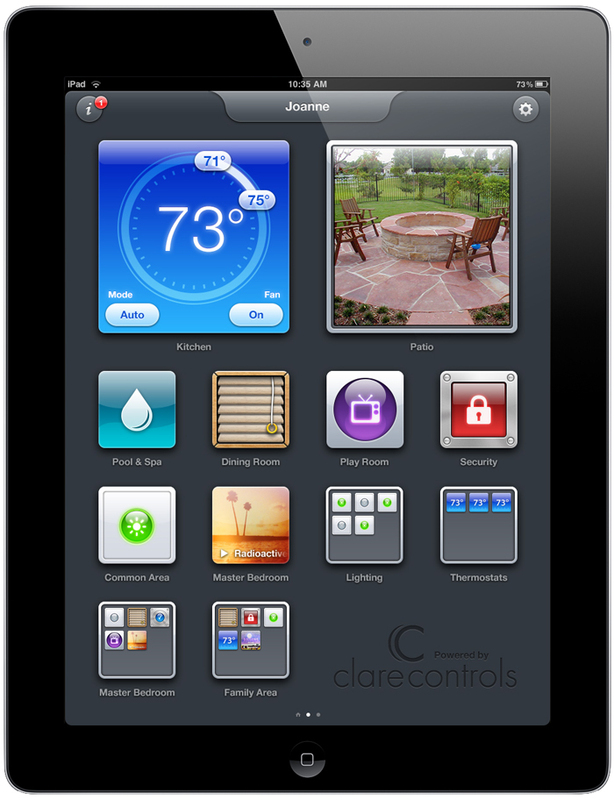 More – Your ClareHome system works with a growing library of 1,800 devices, including pool and spa controls, motorized window shades, and more. Ask your sales representative about additional applications.